Interested in learning more about Catholic education? 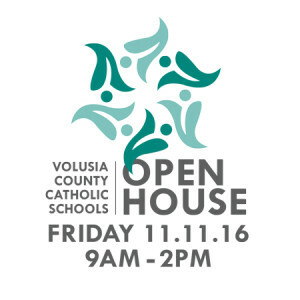 Six Volusia County Catholic Schools will be hosting an Open House November 11, 9 AM – 2 PM. The Open House will include school campus tours and the ability to meet administrators and teachers. Admissions and financial assistance information will be available. Volusia County Catholic Schools Open House will also provide an opportunity to discover the many benefits of a Catholic education, such as curriculum, enrichment programs, faith formation, extracurricular activities, and athletics. Volusia County Catholic schools include five elementary/middle schools, which serve Pre-K3 and VPK-4 through grade 8, and Father Lopez Catholic High School, a college preparatory that serves grades 9-12. Visit any of our five elementary Catholic schools on Friday, November 11, 9 AM – 2 PM. Father Lopez Catholic High School Open House is on November 13th, 1-4 PM. No RSVP required.